The game of American football can be quite dangerous, therefore a wide array of football gear is required to prevent serious injuries. Each NFL team employs an equipment manager, and it�s his job is to provide players with the necessary items and repair anything which becomes damaged. While athletes are the most important element of the game, wearing the proper equipment can mean the difference between success and failure. 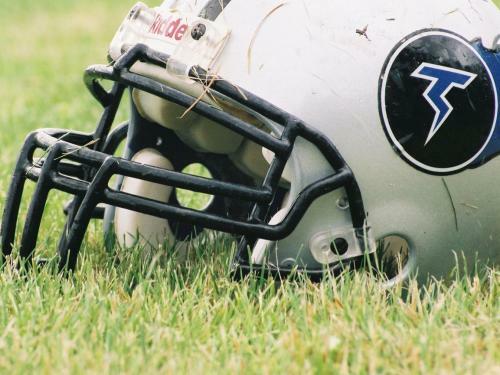 Perhaps the most important piece of equipment for an NFL player is the football helmet. With so many violent collisions during the game, a concussion would be guaranteed without this item. It�s also important that the helmet is custom-fitted to the individual player wearing it. A football helmet consists of the following pieces: shell, jaw pads, air bladders, face mask, mouth guard and chin strap. Each piece of equipment is available in different styles to best outfit the player. For example, most teams stock 15 different types of face mask. In the early years of football, quarterbacks either received the plays during a team time-out or from various hand signals from the sidelines. But since 1994, the league has allowed wireless communication via a small radio in one ear hole of the quarterback�s helmet. While crowd noise can still play a factor, it allows the coaching staff a clear line of communication to the leader of the offense. To ensure that a helmet fits properly, an equipment manager will often use an inflation bulb and set of calipers. The calipers are used to measure the size of the player�s head. Once the proper sized shell has been selected and placed on the player, air bladders inside the helmet will be inflated by inserting the inflation bulb into two holes located on the outside of the shell. Jaw pads are also inserted to make sure the helmet fits snugly against the face. The neck roll is also an important piece of equipment for football players, as it helps lessen the chance of severe neck injuries. It is basically a foam roll which hugs the back neckline of the player�s jersey. If a player�s head is snapped or pushed backwards, the neck roll is designed to limit how far back it can go. Mouth guards are pieces of plastic which allow players to bite down on them. This helps prevent broken jaws and teeth. These guards are custom-fitted to players by placing them in hot water, allowing the plastic to soften, and then having the player bite down on them. As the plastic cools, it will conform to the shape of the player�s mouth. While it�s vital to protect a player�s head from injury, the body is also in considerable jeopardy during a football game. Most hits will be to the body, so a series of pads have been designed to lessen the impact and redistribute the force of the blow. Shoulder pads are constructed of a hard plastic material, and padding is placed underneath for a comfortable fit. 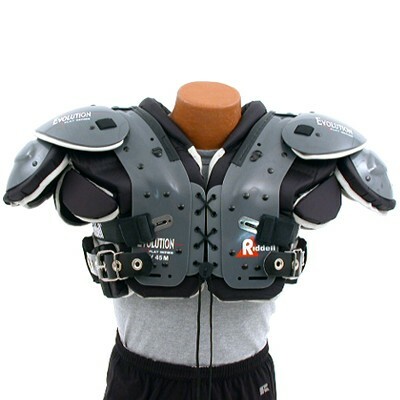 Different styles of shoulder pads are available for various positions. For example, lineman may have extra padding to prevent their equipment from being grabbed and used as a handhold for opposing players, while quarterbacks and players suffering from rib injuries may use extended padding which resembles a flak jacket. Additional padding can also be attached with Velcro, which is useful for providing extra protection to the body of injured players. 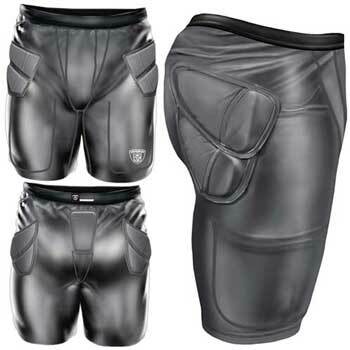 Hip, thigh and knee pads protect the lower body from collisions, and a number of styles are available. While hip pads are fitted around the player�s hip and pelvic bone, the other pads fit into pockets on the inside of the player�s pants. The amount of padding is up to the individual player, and wide receivers, for example, are known to wear little lower body padding in an effort to make themselves faster. Besides providing decoration, a player�s pants and jersey allow him to be identified by fans, officials and teammates. The team logo and player�s number will be prominently displayed on the jersey, and special strips of Velcro are included on the bottom to help keep jerseys tucked in. Some players have even been known to apply special tape in order to make their jerseys stick to their shoulder pads. The proper shoe is very important in football, as wearing the wrong type can contribute to severe knee injuries. Throughout the season, most teams will play indoors and outdoors in a variety of conditions, so it�s important that a number of footwear options are available to them. A team�s equipment manager and his staff are responsible for making sure each player has the necessary shoes. It is estimated that an average NFL team will go through over 2,000 pairs of shoes in a season. Shoes are especially important on Astroturf fields, as choosing the wrong style can cause a player�s foot to momentarily stick to the surface while the body continues to move in another direction. This has led to more than one player tearing their ACL and being lost for the season. Even with the right equipment, knee injuries are an unfortunate part of the game and a constant risk. When playing on Astroturf, it�s desirable to wear shoes with the least amount of �bottom.� This is the measure of the thickness on the bottom of the shoe. Light bottoms are used for dry conditions, while a thicker sole may be used for damp conditions. If the field is particularly wet, the thickest bottom possible (known as �Destroyers�) may be used. When playing on a natural grass surface, players will wear cleats instead of shoes with a molded bottom. 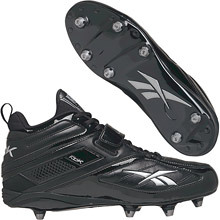 Cleats vary in size from � inch to a full 1�. One-inch cleats are rarely used, and will most often be brought out for frozen field conditions and sub-zero temperatures. As a game progresses, cleats can be changed by the equipment staff using an electric stud driver. The seven old cleats are quickly screwed out, while the new cleats are quickly screwed in. The process is more difficult on Astroturf, as the entire shoe must be replaced. Many players tape their shoes, and most wear some manner of orthopedics to make the shoes more comfortable. This means that tape will have to be cut and the orthopedics must be removed and placed into the new shoe. Then the new shoes will need to be taped to the player�s satisfaction. While gloves are not required, many players choose to wear them. 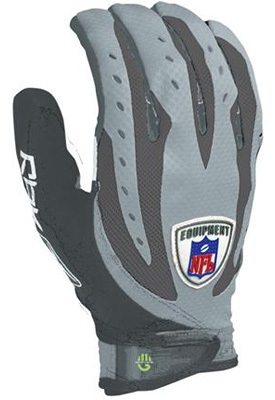 Gloves for wide receivers, commonly known as tact gloves, often have a slightly sticky palm to better enable them to catch the football. The gloves of lineman, meanwhile, have thick padding to help prevent injuries while fighting off opposing players. Each NFL team has an equipment manager, and their primary responsibility is making sure that each player has the necessary items. They must also keep track of the team�s supply of equipment and make sure that it arrives safely at away games. Equipment managers and their staff must know the surface conditions of each field in the league, as well as the possible weather for an upcoming game. A player�s injury history is also important, as pads can be layered to protect particularly sensitive parts of the body. This covers the basic equipment used by modern NFL players, but technology continues to constantly produce newer and lighter items for the game. Just as equipment used 100 years ago now looks hopelessly ancient, imagine for a moment what football gear might look like in another century or two.